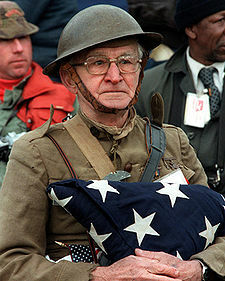 Joseph Ambrose, an 86-year-old World War I veteran, attends the dedication day parade for the Vietnam Veterans Memorial in 1982, holding the flag that covered the casket of his son, who had been killed in the Korean War. In 1953, Alfred King, who owned a shoe store in Emporia, Kansas, had the idea to extend Armistice Day to include all veterans. The Emporia Chamber of Commerce got behind the idea, and, a year later, got a bill through Congress changing Armistice Day to Veterans day, to honor all of America’s veterans. Gästehaus Schmidt would like to thank the Veterans of all our wars for the service and sacrifice. /wp-content/uploads/logo-new4.png 0 0 Jeff /wp-content/uploads/logo-new4.png Jeff2016-11-11 11:00:252016-11-01 10:51:55Thank You, Veterans!